Image caption Russian bishop Metropolitan Hilarion said recognising Ukraine's Church as independent went "against historical truth"
In a major religious split, the Russian Orthodox Church has cut ties with the body seen as the spiritual authority of the world's Orthodox Christians. The break came after the Ecumenical Patriarchate of Constantinople recognised the independence of the Ukrainian Church from Moscow. The row is being described as the greatest Orthodox split since the schism with Catholicism in 1054. Relations soured after Russia annexed Crimea from Ukraine in 2014. Many Ukrainians accuse the Russian Church of siding with Russia-backed separatists in the east. Russia sees Kiev as the historic cradle of the Russian Orthodox Church and the Church now fears losing many of its 12,000 parishes in Ukraine. Constantinople holds sway over more than 300 million Orthodox Christians across the world. The Russian Orthodox Church is by far the biggest. What does the Russian move mean? The Russian Orthodox Church has traditionally seen parishes in Ukraine as under its jurisdiction. It has now said it is impossible to continue being in "Eucharistic communion" with the Istanbul-based Ecumenical Patriarchate of Constantinople. This means that priests from the two patriarchates cannot serve - and worshippers cannot take communion - together, wherever Orthodox Christianity is practised. 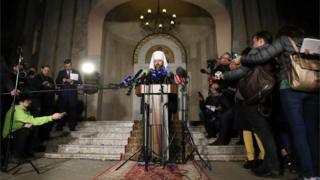 The decision was taken on Monday at a meeting of the Russian Orthodox Church's decision-making body, the Holy Synod. Leading Church figure Metropolitan Hilarion said last week's move by Constantinople to recognise the independence of the Ukrainian Church went "against historical truth". Constantinople - seen as the first among equals in the world's Orthodoxy - also overruled its decision dating back to 1686 to transfer its jurisdiction over Kievan Orthodox churches (known as the Kievan Metropolis) to Moscow. And it reversed the excommunication (anathema) by the Russian Church of two top Ukrainian clerics, who lead the until now unrecognised churches in Ukraine. In practical terms, the concern now is over what happens to the thousands of sites in Ukraine where services by the Moscow Patriarchate are held. Moscow has voiced fears over possible clashes during any dispute over control. And Russian President Vladimir Putin last week convened the country's security council to discuss the issue. However, the Russian Orthodox Church also said it hoped Constantinople would change its mind so that a schism could be avoided. How has Ukraine reacted to Constantinople's move? President Petro Poroshenko said the Church's independence went hand-in-hand with Ukrainian independence, adding: "It's an issue of Ukrainian national security. It's an issue of Ukrainian statehood." Ukrainian clerics of different Orthodox denominations - including some bishops from the Moscow branch - are now planning to hold a meeting known as a cathedral to elect a leader of the new Church. Ukraine became independent in 1991, with the dissolution of the Soviet Union, but Russia's support for separatist rebels in eastern Ukraine has poisoned relations with its neighbour. The Moscow branch of the Ukrainian Church has denied being a tool of the Kremlin, and says it has tried to bring about peace in eastern Ukraine. Although the Church has the biggest number of parishes in Ukraine, its influence has been rapidly declining in recent years. Pro-Kremlin television in Russia have been highly critical of Constantinople, accusing it of "meddling". A talk show on the Rossiya1 warned that "radicals" may start seizing churches as soon as Moscow's control weakened. The Russian government's official daily paper, Rossiiskaya Gazeta, argued that Constantinople had lost legitimacy. Another pro-government paper, Izvestiya, spoke of "one of the darkest days in the history of Orthodoxy". But the mood has been different on social media, where many have no sympathy for the Russian Orthodox Church. According to prominent blogger Rustem Adagamov, it was "nothing but a religious sect set up by Comrade Stalin in 1943".